Brad Heyden lives in Douglas County with his wife, two sons and daughter. Brad is a native of Colorado and grew up in Arapahoe County. During his years at Arapahoe High School between 1981 to 1983, he was a member of the Arapahoe Rescue Patrol, a youth search and rescue foundation that allows its members to interact with Littleton police and fire departments. 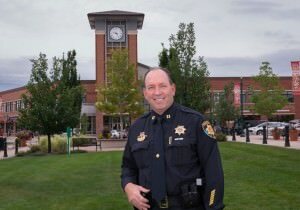 He started his law enforcement career in January 1987 attending the Arapahoe Community College Police Academy and graduating in May 1987. In January 1988, he was accepted as a reserve police officer with the Cherry Hills Village Police Department. In April 1988, he began his career as a deputy sheriff for Douglas County. He served in the Patrol Division and was promoted to corporal in March of 1993 and transferred to the Detention Division. He was again promoted to sergeant in April 1995 in the Detention Division. In 1999 he was promoted to patrol lieutenant. Brad has served as the captain of all of the divisions. Brad has had the following special assignments during his career: hostage negotiator, K-9 handler, inmate work release coordinator, court security supervisor, facility security and electronic security liaison, transition team member to the new justice center, Verbal Judo instructor, less lethal munitions instructor, distraction device instructor, Oleoresin Capsicum (pepper spray) instructor, use of force instructor, firearms instructor, Detention Division corporal and sergeant, Patrol Division deputy, sergeant and lieutenant. Brad holds a Bachelor of Science Degree in Management from National American University and a Certificate of Completion of Basic Police Academy from Arapahoe Community College. Brad is also a graduate of the FBI National Academy Session 224. Brad is also a graduate of the FBI National Academy Session 224.